Here's a little trick that will add a dose of neoclassical shred to your everyday licks. It's not going turn you into the next Swedish wunderkind, but it will get you through the next time you have to "Unleash the Fury!" 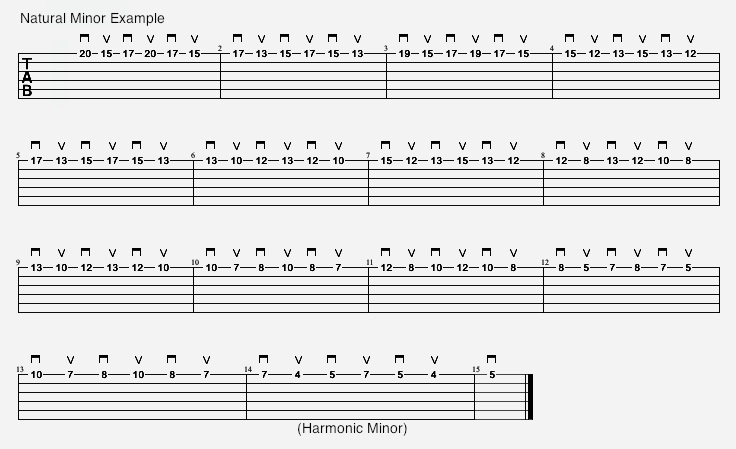 We'll start by breaking up the Natural Minor scale into six note patterns on a single string. These are just three note groups doubled up. Each group is picked Down, Up, Down, Up, Down, Up. Now do the same with the Harmonic Minor scale. Practice playing each group in turn ascending and descending. Practice slowly with accuracy in mind above speed. Keep the motions of your picking hand and fretting hand as small as possible. As you get comfortable, gradually increase your speed. 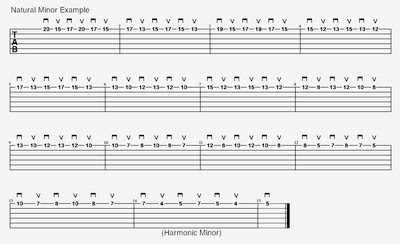 Once you've got that down, apply the following three patterns to both scales. Once again move it up and down the scale. After a while, you can start chaining the patterns together in different combinations. The next examples will help get you started. These patterns will work on any string, so feel free to move them around.